MARKS&SPENCER'S YELLOW MIX COLOUR BUT I SEE IT MORE AS GOLD AS IT'S SATINY. Lovely little gold woven top. with leaf patterns in subtle pink and gold. very short cap sleeves, plain scoop neckline. zips top to bottom at back from nape of neck to hem. It is size 4 so very small, Euro size 32, US size 0. The fabric has no stretch at all, so be sure a 4 will fit. Length from nape to hem is 37.5 cm. Such a super top, so smart and pretty. Bought from ASOS. Teal / turquoise coloured Cotton Lace with silk trim. Can be worn over trousers or skirt as a tunic or with shorts, leggings or underslip as a mini dress - very versatile. Gold & Black zig zag print front. Cap sleeves. Our model wears a UK 10/ EU 38/ US 6 and is 178 cm / 5′ 10″ tall. AFFORDABLE FASHION JUST FOR YOU. Black jersey back. Wash at 30. Pretty gold sequined top from Warehouse size 14. A lovely smart flower pattern gold blouse top for girls ladies. Occasion party or casual. Chest from pit to pit - 22" (56cm). 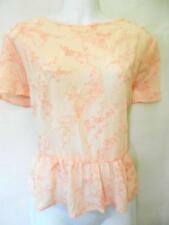 Fully lined stretchy cap sleeve top with pretty crochet style floral pattern. Pit to pit size 23 in /60cm. Length 24 in /61cm. UK size 12. Buttons to back. Condition i s used.T he t op f as te ns a t th e ba ck w it h a li tt le b ut to n. It i s a li tt le s ee t hr ou gh s o yo u ma y ne ed t o we ar a v es t.
Shoulder to hem - 23". Occasionally a piece of clothing may turn out to be a lot flatter once parcelled up. Underarm to underarm - 21". As seen in the listing photos; carefully examine pictures. THIS ITEM IS NEW BUT WE ARE AUCTIONING AS USED. No known defects or issues except for missing tags and labels, 100% Polyester Ask us any type of question before purchasing this item to save inconveniences associated with returns otherwise buyer pays for return both ways. Please do see our other listed designers item in other categories. Pretty top with a gold mesh V neck covers in sequins . There is snow at the back of the neck . The waist is elasticated . Arm pit to arm pit is 40 Inches . And it is 28 Inches Long . FAB LINED BLACK AND GOLD TOP BY INSPIRE IN VG CON SIZE UK 22 BUST 48"
F or sale is this gorgeous top that has been hanging in my wardrobe a while and never worn. It has a cheeky revealing v neck with small cap sleeves. 95% polyester, 5% elastane. Machine washable. This week I am selling a lot of items and all at the starting price of 99p and that is the price I will sell them at if necessary. This is in Good Condition. Please bid with confidence by checking out my 100% positive feedback. I’m afraid I can’t be held responsible for any sizes I can only go with the size on the label, if you need other measurements please ask. Please check out my other items as I do sell a lot of new and used designer clothes and shoes. Good luck and happy bidding. TEMPERLEY London Gold Sequin Evening Top. 2 pieces of gold sequin adorned material from the back of neck. Cap sleeve effect to the front. High empire waist band under the bustline. Length of fastening around waist: 29" (unstretched). Wallis Crochet Top UK 10-12 US 6-8 EU 38-40 Gold Sparkle Design. Very pretty silk blend blouse from Maison Scotch. Ornate lace at sleeve Size Small which I’m guessing is fine for a 8 or 10. See pics for measurements. Excellent condition. Almost mint if it wasn’t for one tiny mark. See pics. Colour is a bit darker/ richer gold than pics allow. Take a look at my other listings. Selling lots of other lovely clothes including lots of vintage blouses, dresses and shoes as well as some great brands like YMC, Lowie, Whistles, Sessun, Ganni, Other Stories, Toast, Orla Kiely, Joseph, Reiss, Paul Smith, Paul & Joe, Margaret Howell, MHL, MUJI, Cos, Maje, Boden, Aubin & Wills, and APC. 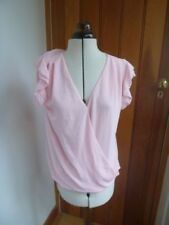 You have a chance to buy this stunning ladies blouse top by river island. 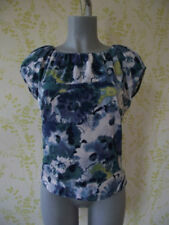 armpit to armpit 25" / length from shoulder to hem 21. has strap across the back as shown in photo. in very good condition. 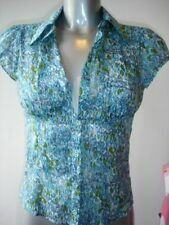 Ladies Burgundy/Gold Patterned Sparkly Over-Blouse/Top size 12 (photo 5). Length 26". Short, Cap Sleeves (photo 3). Photo 4 shows back of Over-Blouse/Top. Collar with turn-backs giving V Neck (photo 2) and 5 button centre fastening. Unbranded Black Sheer Organza Crew Neck Fitted Panelled Cap Sleeve Top Chunky Gold Zip Size: 8 Used but in good condition. From a smoke free home. Selling many other shoes, clothes and accessories due to a huge clear out so please take a look at my other items for sale. Great condition gold colour silky top from the 90s Cowl neck with cente back keyhole and one button fastening Size seam hem splits 2.5" 2 front darts Chest 60 " Hem 54" Armhole Opening 16" Length from side neck point to hem 27" Neck circ 22"
Condition is Used. No labels in neck because I removed them due to being scratchy. I've worn this top once to a concert. It's a pull on top with ties at the back. Super little item, grab yourself a bargain. 👀party/ cruise ★👀👚👀Ladies UK16 (44) Gold Spot Print BLOUSE TOP 👚 -bought From Readmans-BNWT. I can let you have the proof, if you need to make any claims. Apologies in advance for this! ♻️ Reduce Re-Use Repair Recycle Regift ♻️. 23" across chest. 24" across waist. 24" from shoulder to hem. Wallis metallic gold ladies tops size L preowned. Cut with an empire line so very flattering for the waist. Condition is Used but in excellent condition. Dispatched with Royal Mail 1st Class. New Look Evening Top / Blouse. Button through Gold and Black Lace. Size: UK 10. I have tried to include as much detail as I can.